Last minute annual appeal tips … and answering the age old question: hand-addressed or printed envelopes? Along with the signs of fall, you’re probably already seeing the first of the *annual appeal* letters appearing in your mailbox. I’m one of those geeks who makes a practice of collecting ‘em – and, yeah, I must confess that, for the most part, my collection provides examples of what NOT to do :). 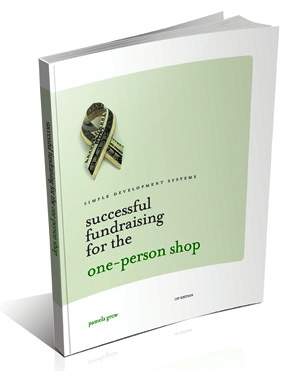 So here are a few tips for getting the most out of your annual appeal this year. I am writing to you from Clermont County in Ohio – very close to Cincinnati. I thank you so much for your Grow Report wisdoms. Your recent one made me laugh. The one about sending funders updates several times weekly, which was a typo. You wrote again to clear it up. For heavens sake! I knew you meant a “few times a year.” Were people actually hounding you about that? Oh goodness. I just shook my head for you on that one. I do want you to hear that your emails give me inspiration. I am with a small not for profit and I often feel like I am all alone… your words often come at the right time. We help teach adults how to read and there are only two of us here. Everyone else is a volunteer. Now, I wonder if you can settle a bull-headed argument with a board member! Is there anything out there that can validate a hand addressed appeal-letter mailing yielding MORE donations than those that are simply “non-lovingly” printed and sent? I would sure appreciate your feed back. Everything I’ve ever read and every study that’s been done points to hand-addressed envelopes out-performing printed. The objective here is to get your envelope opened, right? And, whoa, isn’t seeing your name correctly spelled and hand-written enough of an intrigue to get you to open an envelope? On the other hand, how I answered Susan would depend on her particular factors. How big was this mailing? Would it be done in-house or using an outside service? Were volunteers or board members available to hand-address? What’s the size of your mailing list? Will you be doing your mailing in-house – or will you be using a service? Is your board available to help hand-address and write notes? Not only are board members on hand but volunteers-a-plenty with enough pre-planning. Once we get all hand addressed, I then have the ability to farm the whole mailing out to a school for people with disabilities that does bulk mailing. They have already stepped forward and offered to take the mailing from there – even to the post office. If this happens, our appeal letter is going to incorporate all of the helping hands that went in to the mailing of it. Thanks to teachers like yourself, I am learning!! Excellent! Clearly the Literacy Council has the resources to hand-address this year’s appeal and can and should do so. But hey, wait a minute … BULK mail? Uh oh. As my friend John Lepp from direct response agency Agents of Good said: first class all the way, all the time… even the type of stamp you use can make a difference. As an addendum to your suggestions: it helped get the ball rolling for us and clear up some stumbling blocks. We are now pushing ahead with a first class mailing with a very special hand chosen stamp, hand addressing each envelope and having some of the letters even receive a hand-written note by a board member or the executive director. Then, we are scheduling a “Stuff and Fluff” party over several days to get the mailing out in a timely manner. The air is playful and in anticipation of positive results. It helps that we have done several of these in the past but none with this much polish!! Thank you again Pamela. Sometimes it takes finding that right “sounding board” to help inspire and bolster the confidence. Kudos to Susan! I guarantee this year’s appeal will be the Literacy Council’s best yet! He’s right. And, speaking from someone who spent most of her “job-job” life in small development shops – often preparing appeals on antiquated equipment, absolutely do-able with today’s technology. If your individual appeal is done in-house, for God’s sake figure out mail-merge and do it right. It’s well worth the extra effort. 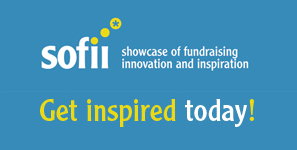 What are your last minute annual appeal tips? Just got my school district foundation underwriting letter and I’ve got to say — the 5 small notes & signatures, some from people I know personally, were a nice touch that caught my attention. I think having mail from members or supporters (not staff or board) is important. A letter explaining (in their words) why they support the organization, what it means to them, etc. That’s a terrific tip Bunnie – thanks for sharing! Love, love, love this type of post! I literally read it before the dept. had a fall appeal meeting so it couldn’t have been more perfect. I convinced everyone we should hand address a few segments (there’s no way we have the manpower to hand address all! ), use 1st class stamps on most, include a personalized letter in each piece and limit what goes to the mailhouse. Even our pres bought in to all this (a rarity around here)! Please post more things like this – very tangible ideas that we can easily implement. I’d love to see one with unique stewardship ideas. Word to the wise, however. The post office must “hand-process” all the hand-written mail. So if there is any “timeliness” issue in the delivery of an appeal, this added time should be taken into account. Hope this helps with all the planning! When I questioned the supervisors at two different post offices I was informed that hand-written envelopes do not delay the processing unless the handwriting is illegible. On the other hand bulk mail can sit around for quite awhile until it’s delivered. Bulk mail is not the post office’s first priority. When you’re working with a mail house it’s vital to find one with a familiarity of YOUR local post offices as each one differs (I always recommend interviewing at least 3 mail houses before selecting one, particularly if you’re renting a list). Thanks so much for the feedback! Thanks so much Kelly – it’s terrific to hear that this made an impact on your fall appeal. I’d love to hear how it works out for you. When it comes to stewardship, Lisa Sargent is the master. 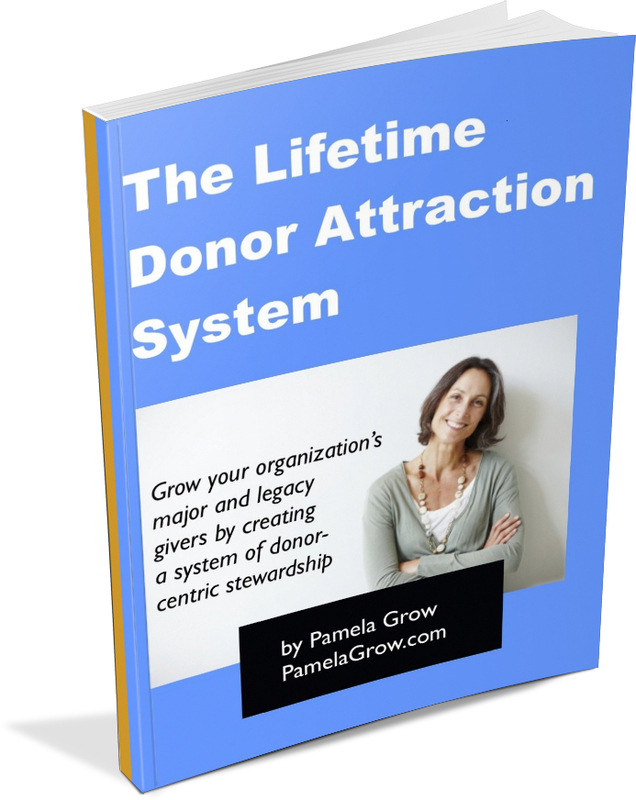 Did you download my *Creating Lifetime Donors* free report? It’s a transcript of a call I did with Lisa. I’d also refer you to her thank you letter clinic on … where else? – SOFII! This is fantastic advice! I’m definitely going to pass it along to any fundraisers I know who are planning to send out a mailing! This reminds me of a conversation I had with our direct mail house way back when I was Director of Development at PLAN USA. The company, based in Richmond, VA, also did a lot of work for Jerry Falwell, the evangelist who was a master of raising funds in the mail. They had just designed a customized font that reproduced Mr. Falwell’s handwriting and use it not only on the outside of the envelopes, but also in the text of the letter itself! Thanks for sharing this conversation! Small organizations have the flexibility of doing so many things that bigger nonprofits don’t, like handwriting addresses and getting people involved in the stuffing. These little details can make an appeal more successful. That’s such an excellent point Sandy – thanks for commenting. Obsessing on getting the data right is the big mistake we see. Often terrible disasters are created because the data entry staff don’t understand how important their job is. Sloppy data entry kills more “great” strategies than anything else. Handwriting and 1st Class Postage won’t overcome misspelling my name. Get the names right first. So how do you go about creating a focus on what my partner Hoots calls, data hygiene? This post and the subsequent comments inspired (or should I say, convinced) my organization to pull our annual appeal mailing back “in-house” and set up a team of volunteers to hand address the envelopes. We are planning to mail 2000 letters. From past experience, does anyone know how many letters a volunteer can hand address before his or her hand falls off? For example: average rate: 30 letters an hour? We want to use our volunteer team wisely and have enough hands to go around for this task. 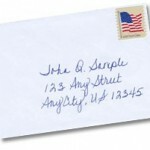 I’ve heard that simply handwriting your name above the return address will have an impact. We’re trying that this year at familyaware.org.